It’s commercial time, though virtually none of this has to do with my personal aggrandizement. Just some cool stuff I thought you should be aware of. First off, if you’re not reading my facebook page (and if you’re not, why not? ), you’re probably not aware of the new internet sensation who made her debut there over a week ago. I just thought I’d share the news with a somewhat different audience here. 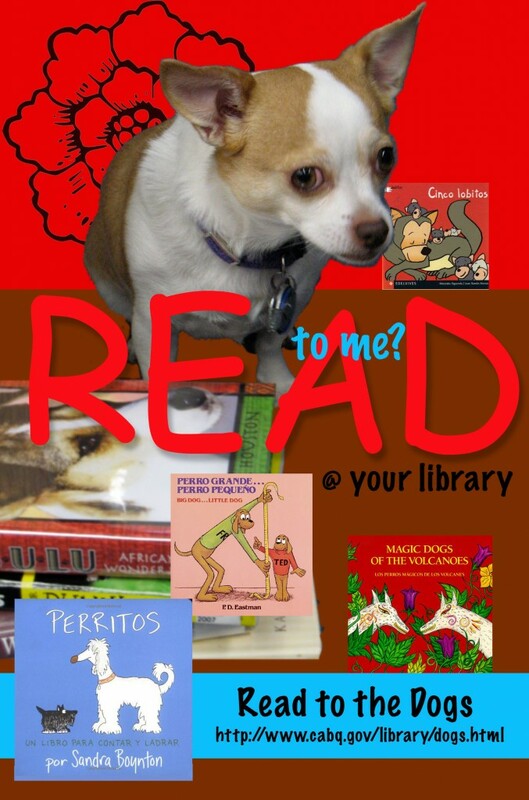 Our dog (one of them, anyway), Skippy the Halloween Chihuahua has made her first poster appearance as the Albuquerque Public Library Read To Me Dog. As weird as it sounds, the Albuquerque Public Library has a program where kids read aloud to specially trained dogs. It actually works. The kids love it. I’m not sure the dogs do, but they’re chosen for their patience and they generally just sit there and take it. (Parenthetically, like many media creations, this campaign is something of a fraud, as Skippy is actually not a Read To Me Dog herself, but is just cute.) So here she is, straight from the Albuquerque City web page directly into your hearts. 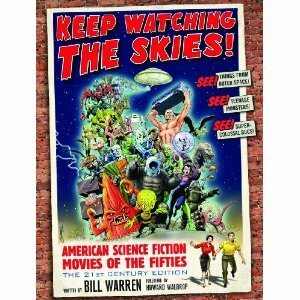 Secondly, I finally got a copy of Bill Warren’s KEEP WATCHING THE SKIES and discovered that there’s no need for anyone to ever write another book on ‘50s science fiction movies. SKIES is absolutely the last word on the subject. In fact, it’s not a book. It’s a tome. The only thing wrong with it is that it weighs approximately half a ton, yet, simply by reading it my wrists and forearms have grown considerably stronger, so that’s all not bad. It comes in at a whopping 1004 oversized pages of closely spaced type and lots and lots of photos. I mean, Jesus, even IT CONQUERED THE WORLD has over three pages devoted to it. Plus, this new 21th Century Edition has a foreword by my pal Howard Waldrop, pop-culture maven and probably the best short story writer working in America today (and if you haven’t read Waldrop, goddamnit, run out RIGHT NOW and get one of his books. Get the one with “Night of the Cooters” in it, which tells what happened to the Martian war machine that landed in Texas, and you’ll be hooked.). I now have a new goal in life. I’ve got to stick around until I see every movie discussed in this book. I’m making a list right now. Thirdly, I’d never heard of CHILDREN OF THE NIGHT, James Gresham’s book which first came out in 2007 until Bruce Hershenson started offering copies on his auction website a couple of weeks ago, and I got one for $24.99 (It’s $99.99 on Amazon). It doesn’t quite live up to it’s subtitle (“A Comprehensive Guide to Horror Posters”), but that’s a minuscule nit. What it is is about 275 pages of one thousand color reproductions of movie posters, window cards, and lobby cards of selected horror movies from the teens through the 1940s, with a little anecdotal info on scarcity and pricing thrown in for lagniappe. Face it, doesn’t matter if the one sheet from Karloff’s THE MUMMY is $600,000 or $60,000. I’m not going to be able to get one anytime soon, and probably neither are you. There are too many awesome images in this book to show here. If you’re at all a fan of these movies, you need it, especially at Hershenson’s price. I don’t know if he has any more left, or if he was just offering them to people who won an item in his auction, but I’ll include his url so you can check. Tell him Cheese Magnet sent you. His website is a great place to while away a few hours searching for that elusive lobby card to complete your set of GOLIATH AND THE VAMPIRES, or to find the German one sheet for GODZILLA VS. MEGALON (I got it; it’s great.). Fourthly and finally, the new expanded edition of the first Wild Cards book, called, oddly, WILD CARDS, will be available on Amazon on Monday. This is an expanded version of the original 1986 edition. We did not ret-con the series. We did not make Aunt May a hippie chick, or anything crappy like that. We just added a few stories to close some gaps. Since I had a story in the original edition, I was ineligible to add one, but because this is a shared world anthology, I had the pleasure of reading Carrie Vaughn’s take on my character Wraith in her “Ghost Girl Takes Manhattan,” a screwball adventure set in the club scene of early 1980’s New York City. Plus, this one comes with an awesomely beautiful Michael Komack cover that may be the greatest ever on a wild card book, and since there have been over fifty editions in nearly half a dozen countries (with Italy and Spain signing on soon), that’s saying something. Thanks for listening. We now return you to your regularly scheduled gooey cheesy goodness.